What is a LED face mask ? At the outset let us briefly look at what is LED face mask? In simple terms it is a mask placed on the cleansed face and through which colored light is passed onto the face for about half hour or so. These lights play a myriad role of increasing the facial blood circulation, promote collagen production, acne reduction and skin healing. These are like state of the art futuristic looking masks,like a cave of lights. The five celebrities who love LED face masks are Jessica Alba, Kate Hudson, Emma Stone, Lena Dunham and Kourtney Kardashian. Of course there are many more, but these five would be enough to bring forth the reason why these masks are well loved. Dermatologists recommend that these multi colored UV-free wavelength help improve the complexion. Hence it is a big hit with the celebrities. So what Shani Darden is trying to convey by explaining scientifically is that in today’s world , LED lights are becoming ubiquitous and it encourages plant growth (proven in greenhouses), therefore, it can have similar rejuvenation properties for the human skin. For Jessica Alba and most of the other celebrities , Darden uses three different colored lights : Red to reduce aging. Blue to kill bacteria and existing acne and pink to accelerate skin recovery. Of course there are a couple of more lights including a white light for relaxation etc. Researching on this topic, it has thrown light on how these multi colored UV-free wavelength boost collagen production. Our human skin is constantly renewing itself, but as we age collagen production starts diminishing . Collagen production keeps the skin elastic and strong and in the absence of these two the skin starts to lose its lustre and sheen. Skin starts to wrinkle and that is something every young woman in this world dreads. Spending half hour under the LED lights bring back the elasticity of the skin and makes it strong. Thus it helps in anti aging and makes the skin glowing, soft and dewy. The unfortunate part is that the masks are a little scary looking, but then that is for the beholder. The person going through the treatment is blissfully enjoying a relaxed state under the multi colored lights. It is hugely popular amongst the celebrities and stars despite the fact that the mask makes one look like Michael Myers from Halloween film or the scream movie. Basically if one has to sum up, the masks are horrendous looking but what is inside is glowing beauty. Celebrities like Kourtney Kardashian said that in a couple of sittings it made a great difference to her skin, though she did scare the daylights of her fans by putting up her photo with the mask on instagram. 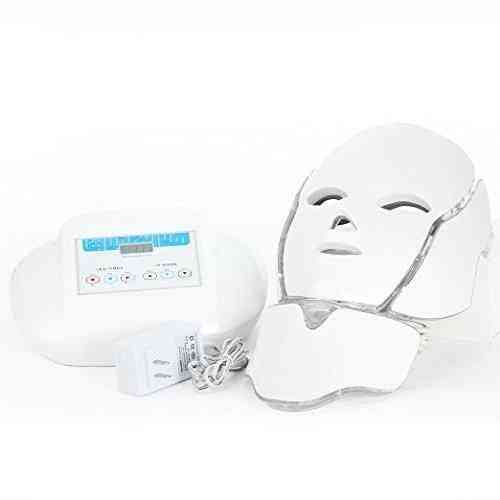 As the results have been very promising as depicted by the famous celebrities, these scary looking masks with LED lights have become quite popular with a lot of ordinary woman too. They are ordering and using the at-home LED masks and using the same to get rid of their blemishes, wrinkles , acne and trade them for a super smooth glowing skin. Now these ladies do not need a professional and expensive aesthetician to use a fancy device on their face, when they can manage the same in the comfort of their home. Like the celebrities, these young women too want to look young,glowing and beautiful as them. This they can now do so by fighting the arch enemy of woman called aging. Therefore, we can comfortably conclude that these grotesque looking LED face masks are here to stay and have got the endorsement from a lot of celebrities as they are hugely popular amongst them. Why are they so acceptable ? It is because it helps in fighting aging, reduces wrinkles, gets rid of blemishes and ache. Result is that wonderful, “peach and pink” glowing skin. Celebrities being rich and famous are endorsing the same as it brings out the best in them.